Commercial wind energy consumption first began at the beginning of the 1980s as a result of the oil crisis in the USA, and in California in particular. Although German and Swedish attempts at direct entry into large-scale wind energy technology in the USA were unsuccessful, small-scale Danish plants were the first to conquer the American market. Germany began its venture into wind energy consumption after the Chernobyl nuclear disaster of 1986. By the early 1990s, European markets had become more significant. Denmark led the way in terms of European wind energy consumption, followed by the Netherlands and Germany, and later by Spain. In the year 2000, Germany took the lead position on the international wind energy market with an increase in capacity of 1,700 MW, ahead of Spain (800 MW), Denmark (600 MW), Italy (400 MW) and India (200 MW). In subsequent years, the markets shifted significantly in favour of Asian countries. 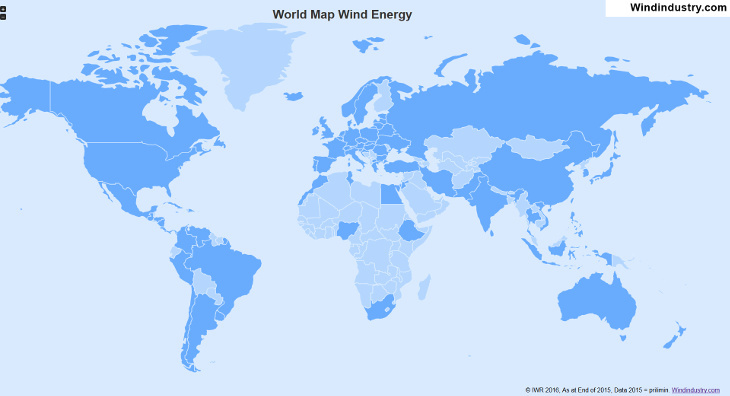 China was the most important wind energy market in 2016. With a newly installed annual capacity of 23,300 MW of wind output, China accounted for about 43 percent of all newly installed wind energy around the globe in 2016. USA followed in second place (8.200 MW) ahead of Germany (5,440 MW). The other countries to feature in last year’s Top 5 ranking were India (3.600 MW in 2016) and Brazil (2,000 MW). With 54,600 MW, the addition of the new installed capacity in 2016 fell significantly by about 15 percent compared to the previous year (2015: 63,500 MW). 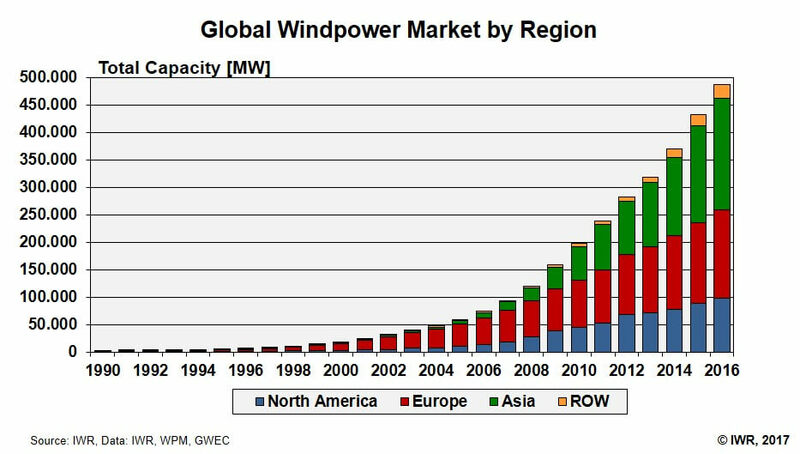 The global wind power total is almost 490,000 MW at the end of 2016.